Which college football conference will be the best in 2015? This morning we opened up our Wednesday roundtable by discussing whether conferences should be allowed to get multiple bids in the College Football Playoff. This afternoon we are back as TSS Associate Editors Bart Doan and Terry Johnson join staff writer Kevin Causey in our weekly roundtables discussing all things college football. 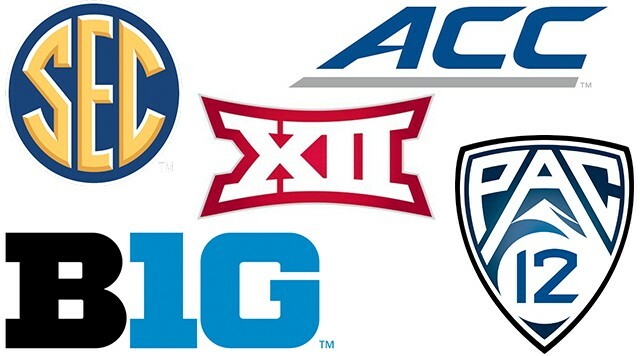 For the afternoon edition of our roundtable we are going to delve into the Power 5 conferences. An interesting topic that comes up frequently is conference pride. Which conference looks like it will be the best in 2015? Question: Which conference looks like the toughest in the land this year? Full confession: conference arguments are like fighting with a woman. Both sides are playing by totally different sets of standards. For my money, when you start talking “conference,” you’re talking top to bottom. The chain is only as strong as its weakest links, and stuff. If only two girls in a group of 10 are 10s, three of them are 7’s, and the remainder of them are 3 – 1’s, how pretty really is the group overall? Yeah, if you are capable of being the guy with one of the 10’s or even the 7’s, fantastic for you. But you probably have a different opinion than the 3’s. At any rate, I’m not sure the gap has been closed enough on the Pac 12 from last year to really suggest anyone other than them going in, though the Big 10 looks close. The Pac 12 though returns what should be a contending Oregon squad, and it’s hard not to like Southern Cal, Arizona, and maybe even Stanford as national players. Past that, the conference is awash with depth, as usual. Pac 12 After Dark is tough to stay up for, but the juice is often worth the squeeze. The biggest curiosity is probably Washington, where you’d figure year two will show some gains in the ballyhooed Chris Petersen era. The Big 10 and probably the SEC are closely behind. The Big 10 suffers from having too many 3 to 1’s and the SEC … I think we’re still kind of up in the air on who can compete for a title in that league on a national level. We’ll get it figured out, though. From top to bottom, I am going with the homer pick. I still think the SEC is the top league in the country. A big reason for that is the quality of the entire conference. In order to really look at who will be the best this year, I think you have to go back and look at 2014 and look at the results of the entire conference. The ACC had 21% of it’s teams win double-digit games but had 42% teams finish with losing records. The Big 12 had 20% of it’s teams win double-digit games and had 40% of teams finish with losing records. The Big Ten had 21% of it’s teams win double-digit games but had 35% of teams finish with losing records. They also had a national champion which should be considered. The Pac-12 had 33% of it’s teams win double-digit games and had 33% of it’s teams finish with losing records. The SEC had 28% of it’s teams win double-digit games and had just 14% of it’s teams finish with losing records. Statistics can be used to prove pretty much whatever you want, but when I look at this it tells me that the SEC was the most well-rounded conference in the country in 2014. Is that going to change in 2015? I don’t think so. They also have teams like Arkansas and Tennessee that are on the rise. The Pac-12 is close but they have two true bottom feeders in Colorado and Washington State whereas the SEC only has one in Vanderbilt. Call me a homer but despite not winning the national championship over the last two years, I still see the SEC as the best conference top to bottom in the land. The gap is certainly closing and with the coaching hires in the recent years in the Big Ten and Pac-12, I believe that gap will continue to close. I’ll go with the Pac-12. Let’s be honest: this league was the best in the country last season. While many will argue that the SEC is the toughest, it’s tough to know for sure because the two leagues didn’t face each other last season. In the absence of a head-to-head meeting, the only meaningful metric to use is how each team fared in the postseason. That tips the scales in favor of the Pac-12. Sure, the SEC posted the most bowl victories (7) of any conference last year, but it also fared poorly against top competition, limping to a 2-4 record versus teams ranked in the Selection Committee’s Top 25. On the other hand, the Pac-12 finished 6-3 in the postseason (best winning percentage among the Power 5 conferences), highlighted by an impressive Oregon victory over Florida State – the only loss of Jameis Winston’s remarkable college career. I expect the league to be just as good this year, which is why I’d say it’s the best in the nation. All of the offenses should pick up right where they left off last season, with 11 of the 12 teams welcoming back seven or more starters from a year ago. Most of the teams enjoy similar experience on defense, with only Stanford, Oregon State, and Washington returning fewer than five starters. However, given that David Shaw and Gary Andersen are two of the top defensive minds in the game, and Chris Petersen’s impressive record (100-18), these defenses will likely re-load rather than rebuild. Which teams have the best QB groups heading into 2015? Where should Braxton Miller play in 2015?